If you love cats, and you love fun, this is a site you will want to visit over and over. Dog is an adorable tabby cat, who will treat you to hours of entertainment. Don't miss Dog's Diary and the Human to Cat Translations. Thank you, Dog and Terry!! This award was such a pleasant surprise, from Krista, of KRISTA'S KORNER. Visit this lovely website for a nostalgic review of the 80's, a tour of Winnepeg, Canada; and meet the adorable Bailey. This lovely award was presented to us by my dear friend, Rua, of WITCHWAY, a truly wonderful site where you can enjoy Rua's orignal poetry as you journey through the beautifully prepared pages. A sense of peace and serenity flows through these pages; and, you will want to go back again and again. What a lovely surprise it was to receive this award from KITTY KAPERS DOMAIN. This is such a wonderful site to visit; and, now you can meet the newest member of the family, the adorable Gabrielle Victoria. Make sure to visit Always Loving Cats to read about Chloe and her Purrgrams; and don't miss the fabulous Indiana Sand Dunes....one of our favorite places, in the world. Thank you, Shirley!! 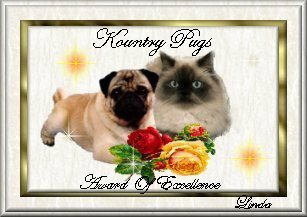 At LINDA'S KOUNTRY PUGS you will be treated to pages and pages of adorable pug pics, applets, poetry and tons of information about these sweet doggies. Be sure to see the Pug Snow Globes! Thank you, Linda, for this beautiful award. Another present we found in our guestbook! This comes from ANIMAL AWARENESS, a wonderful site, full of valuable information and statistics regarding the importance of spay/neuter and animal care, in general. Meet the two precious adoptees, Ranger and Madeline, and read their stories. 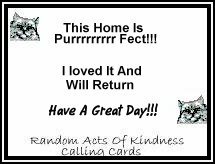 And, be sure to visit all the cats and kittens at Forgotten-4-Paws. Thank you, Sevie! The next two awards were sent to us by Torak, a sweet furbaby who knows the importance of spay/neuter! Visit Torak and read his story at TVAMP'S BASKET FULL OF CATS. While you're there, be sure to see the many pages of cat pictures and information. And, don't miss the "big cats"!! The next three awards were sent to us by some special friends. 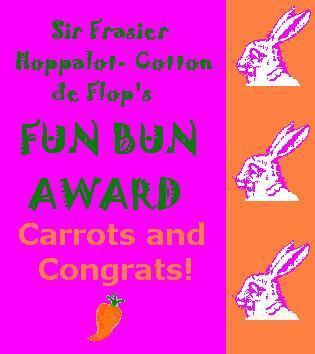 Miss Minnie Minerva is a lovely orange marmalade lass frum Scotland; and Sir Frasier, is her bunny brother!! Oh boy! This means that Miss Minnie likes us!! Sir Frasier wants to share his carrots with us!! Meet Miss Minnie and Sir Frasier at MISS MINNIE MINERVA'S PURRSONAL PAGES (aided by her Bunny sidekick, Sir Frasier Hopalot-Cotton De Flop). Read Miss Minnie's delightful views on her home, living with humans and much more...including important information and animal rights issues. 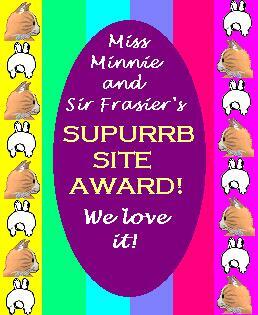 Thank you, Miss Minnie, Sir Frasier and Frances!! 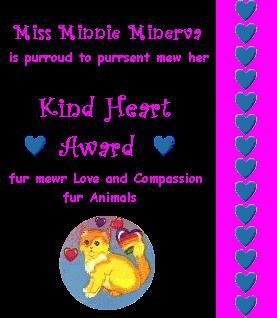 This adorable award came from a precious furbaby, named Rufus. At SUE'S FURRY FAMILY website, you can read about Rufus, and how he got his wonderful home. There are also many stories, and much information. This is a must see site for all animal lovers! Thank you, Sue and Rufus!! 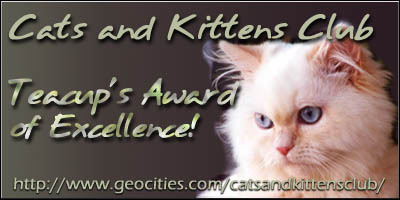 We are honored to accept this award from the CATS AND KITTENS CLUB, for promoting cat welfare. This club is for all cat lovers. There is so much to see and do, including a forum for discussion of our favorite fur critters. Be sure to check out the website; and, if you have your own site, check out their webring, as well!! Thank you, Cats & Kittens.